The Office of Technology and Library Services team has implemented a complete help desk solution, including a centrally-managed ticketing system powered by SysAid, a dedicated support phone number, and staff member availability at the Help Desk in the Lenfest Learning Commons area of the John Stewart Memorial Library. There may be times when staff will need to step away from the desk in order to assist a Wilson community member. If you need one-on-one assistance, we recommend you call ahead to confirm availability or schedule an appointment. Contacting the Help Desk is easy! This full-service Help Desk web client, available via any web browser such as Internet Explorer, is web-enabled software that will allow you to open a new ticket, check the status of open tickets, leave notes for the technician, close tickets, or view closed tickets. We are in the process of developing the FAQ database within the Help Desk, so please check back for more information. 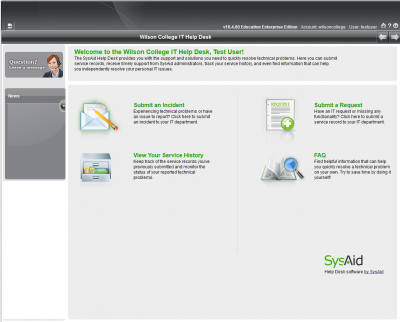 For additional information on using the Help Desk, refer to the Help Desk Quick Reference (PDF). When you email the Help Desk, a ticket will be automatically created and you will receive a confirmation email with the ticket number. It may take up to ten minutes to receive your confirmation email. If at any time you have a question or additional information to add to the ticket, simply reply to the confirmation email leaving the ticket number in the subject line. Your ticket will be automatically updated and a copy of your email sent to the technician assigned to your ticket. 3. Phone: 717-264-4001 off campus or x4001 on campus. Every effort will be made to answer your call immediately. In the event you do need to leave a message, calls will be returned by end of the next business day. In the event of an overwhelming number of calls due to a system failure, the Help Desk will send a campus-wide email with a status update. A staff member will be available periodically throughout the day at the Help Desk in the Lenfest Learning Commons area of the John Stewart Memorial Library. However, there may be times when staff will need to step away from the desk in order to assist a Wilson community member elsewhere on campus. If you need one-on-one assistance, we recommend you call ahead to confirm availability or schedule an appointment. Normal Operating Hours: Monday - Thursday 8 a.m. to 7 p.m.; Friday 8 a.m. to 5 p.m.
For more information, please refer to the Help Desk Quick Reference (PDF) and the FAQs. For any remaining questions, please contact the Help Desk.